The Extraordindary Avatar Expo was last month's showcase for some the strangest, weirdest, and most fantastic non-human avatars created in Second Life. Voters at the Expo selected five Residents from 50 nominees, and I've been featuring over the last couple months. Previous entries include the Arabian Phoenix of Psyra Extraordinaire, the Cute and Creepy Tabula Rasa of Max Case, and Cyberpunk Community Relations Rep Satchmo Prototype. [M]y Neosphere v2 model. My new avatar, which follows a similar theme but is more advanced, I'm titling simply Neosphere. My prior avatars were for personal use only, but this one is meant for eventual sale. I figure having v3 as the first public offering would be a little confusing to some people. Once I got my bearings in Second Life I was surprised, and truth be told, a little dismayed at the relative lack of diversity of avatars. This may sound a little laughable considering that seeing a humanoid wolf walking around wouldn't draw any attention at all in most places in SL, but I was surprised at the sparseness of totally non-human avatars. So I decided I would go out and try to make an avatar that was as inhuman as possible-- and a stylized sphere seemed like the best way to go. Also, I'm a science fiction fan and a compsci geek, and I've always been fascinated by the idea of artificial intelligence. So I decided I would take on a robotic theme. Heh. A lot. The core consists of 170 prims. Each child prim has three scripts for the color management scheme, and the root prim in addition has around a dozen or so to handle various functions. I'll probably be adding more scripts to the core as I develop more functionality... while this way of organization makes for a full contents tab, code readability and compartmentalization are improved greatly. That makes a total of around 522 scripts, which of course means it's good that 510 of them are inactive except when they receive link messages-- if the scripts weren't compartmentalized, all those listens could grind most sims to a halt on their own! My avatar series has had a modular design from the start. The core contains some utility scripts, and the modules more specialized ones. 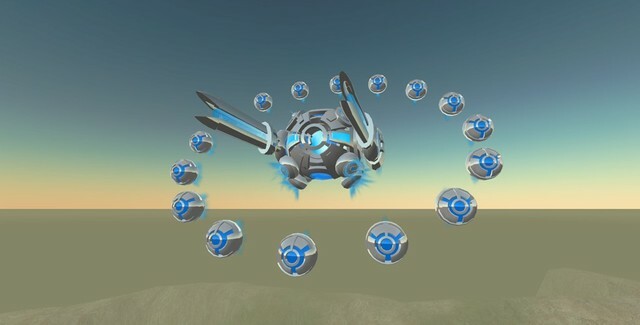 The old series (Neosphere v2) for example, had one set of attachments that launched homing missiles, and another set that managed rezzable drone groups that have dynamic formations, semi autonomous targeting, etc. However, a lot of my old avatar series was done when I was new, and as such is too slow, messy, non-extendable or just plain buggy for my standards now. 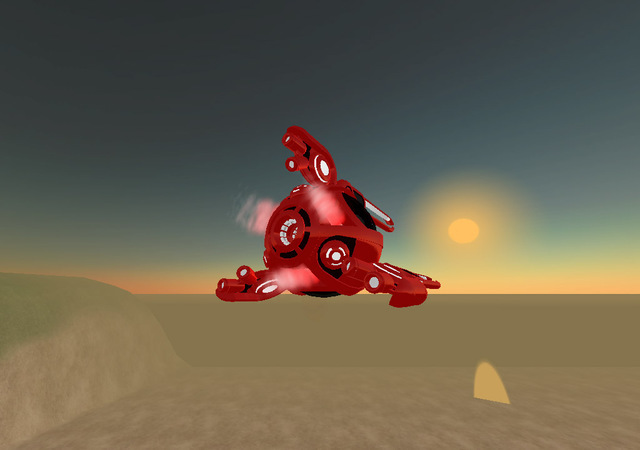 So I'm in the process of recreating my old modules for the new avatar system. 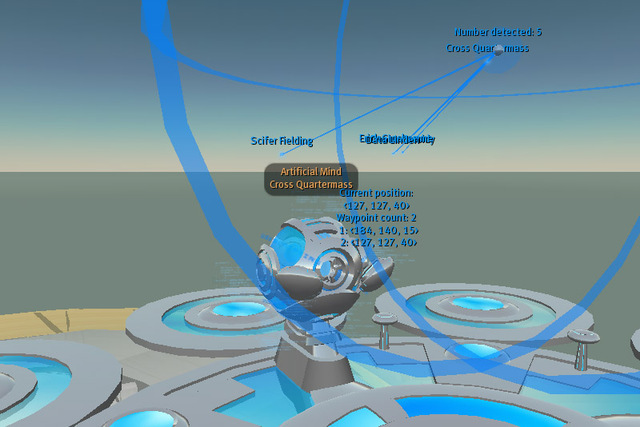 All the scripts in the new system are themselves modular-- I have one master communications script in the core that passes around messages between the various subscripts, and also to coordinate between the core and module attachments. For example, I have an avatar coloring theme system that both allows the user to load avatar themes from a notecard, and to change them on the fly. The user can change the color and the alpha [i.e. transparency] or shine of the three different materials of the avatar. The master comm script is the only script in the core that listens-- it routes color system requests to the master color control script, which then messages the miniscripts in each child prim that then do the actual color/alpha changing. The master comm script also communicates with attachments, authenticating that each attachment shares the same owner as the core, then sends them the color information as soon as they attach, or whenever the colors are changed again. For those with a little programming knowledge, it's my way of trying to simulate object-oriented programming in LSL. I will be selling the Neosphere avatar suite in the near future (within the next month or two, school and work permitting). No info on pricing yet, though I will be selling it modularly and also with package discounts. [smiles] I'm also considering some sort of contest giveaway. Anyways, my as-yet-nonexistent store is called Cross Products, so just check the Find tab for that every now and then. Very very rarely. If you see me as anything other than a sphere, then I'm probably doing something that involves swapping out different test versions of the core. And/or my girlfriend (who plays SL) has bludgeoned me into being humanoid for a time. I am actually planning to make a humanoid avatar with an android theme for those times, but that one will be personal only. Part of the reason why I don't spend much time in the humanoid form is that, well, I find it pretty bland as I've stated before. And also now I do feel like my identity in SL is tied very strongly to my sphere avatar. [Laughs] I have friends that still have never seen me not in sphere form, and some actually apologize when they come across me outside it during testing. To an extent. I'm a member of a group called "Artificial Intelligence", and while the official charter of the group is to discuss its namesake topic, many of us do have non-humanoid, robotic avatars and we have fun threatening the puny bionts from time to time. Also, rumors that I've been working on eradication of the SL biosphere via orbital anti-matter bombardment platforms are greatly exaggerated.